Here goes! My first attempt at the WordPress Daily Prompt. Why not give it a shot although I kind of wish this weren’t the topic today. I don’t really like it. Why? Well, first of all I find it a bit stressful the whole concept of “keeping up”. I live a more Dave Ramsey style life. If you don’t know what I am talking about check him out. Dave is a multi millionaire who preaches and teaches living within your means, getting out of debt and saving for the future. The whole “pay now, play later” philosophy. In a society where we over spend, over eat, over party, over everything, this way of living is quite upside down. If I am going to continue this honesty thing I also need to share that I do suffer from the occasional envy. I am a pretty fit fifty-something but I desire to look 22 again. I am a professional photographer and again find myself wishing I had someone else’s life, clients, encounters. I want to be the gorgeous, skinny woman who can eat the donut, cupcake and drink the chocolate milkshake without the weight gain. Please don’t misunderstand me however, I am a really nice person. 🙂 But I am human and I am flawed. We all are. Envy is just one of a long list of my flaws. I do have my virtues and I do appreciate my life, my husband and friends. I am blessed beyond measure. Now it’s time to indulge my fantasy for just a few moments! Just one luxury item, okay. I will go with the one I find myself saying I wish I could have more than any other. It is not as expensive as most, it is not as big or flashy or shiny as others I could pick for sure but it is a luxury and it would make me really happy. It is a personal sauna. Okay, laugh. I can take it really! Of all the things right? House in the Maldives, a Ferrari, a Hermes wardrobe, Mikimoto pearls, yup I can talk the talk and would gladly do so any time. But let me tell you about my sauna. KLAFS makes saunas and spas for personal and professional use. Part of their mission statement is “to produce KLAFS saunas and spas which offer you the ultimate in luxury and relaxation”. Their tag line is “We’re happy to sweat for our customers!” I love them. They have an awesome mission statement, and awesome sense of humor and an equally awesome product. And NO I do not work for KLAFS nor do I know anyone who does in case you were wondering. My sauna would be a part of my amazing spa-like sanctuary bathroom. It would be made of Scandinavian spruce, light and warm looking and one of the best woods to insure a perfect sauna climate. An ergonomically shaped backrest and wide bench seating would be built for total comfort. The lighting could be set to whatever ambiance I would like to retreat into. My choices would go from a soft candle glow to warm and bright. Since I am indulging myself in the desire to have these moments of pure relaxation in my personal oasis of well-being, I would only want the best “climate” to relax in. Therefore I would have a heating system that will automatically adjust the humidity and temperature that I choose. 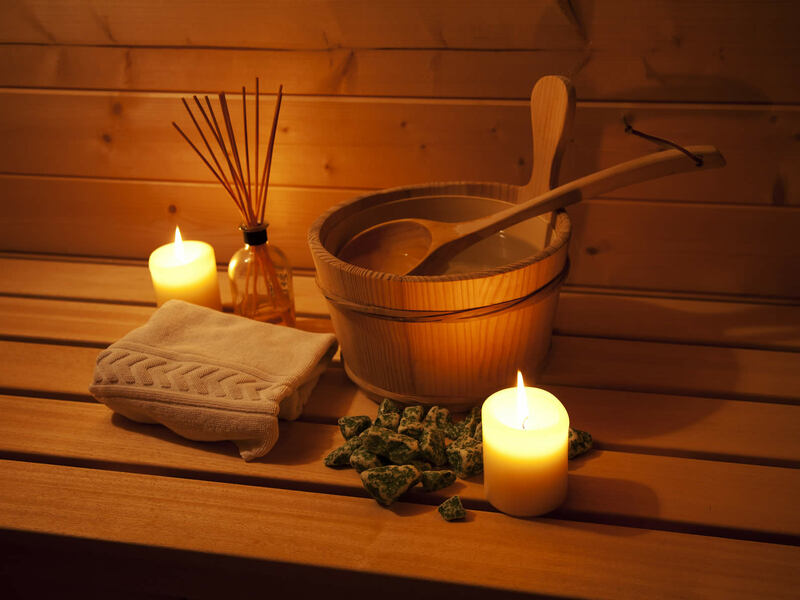 If I want a classic sauna experience I can have that but I also want to have choices like a warm air bath, a tropical bath, an aroma bath or a soft steam bath. Then of course I would want to have my sauna ready to go when I get home so I did not have to wait. I would be able to preset my sauna to be ready when I am! The icing on the cake here would be having all the things around me that would make this experience complete. The Tom Ford bathrobe would be hanging on a hook just outside the door. Silk, lightweight, unique and when I step in and out of it I wrap and unwrap myself in a little piece of heaven. My Baccarat pitcher and water goblet would be filled with Voss water at the perfect temperature; cold but not too cold, and the perfectly cut slices of fresh, organically grown cucumber would infuse the water leaving me refreshed and properly hydrated. Finally to indulge all the senses, music would be a must. I do have a very eclectic taste in music but this is a spa so going with soft jazz, or Michael Buble, perhaps some Zen relaxation sounds or ocean tracks would be most appealing. Of course it would be as simple as pressing a button in my sauna to change my music at any time. And now, I am off! Time to do the breakfast dishes, feed the dogs and walk them, grocery shop and exercise, think about what I am making for dinner, work, and see what I can check off the “to do” list. Maybe when I get home I can jump in the sauna! This entry was posted in daily prompt and tagged daily prompt, escape, keeping up with the joneses, recharging, relaxation. Bookmark the permalink. Who knew? A sauna! All is can is “we are in charge of our own happiness”. I guess you will have to start budgeting. Love you.